The iPhone ranked among the most popular gadgets to hit the market in 2007, so you would think that this year’s Consumer Electronics Show—North America’s largest trade show—would be rife with add-ons and accessories. But while there were plenty of iPhones at CES, they were more often in the hands of attendees than being shown off at booths. One could hardly turn around without spotting someone tapping, pinching, or flicking the iconic device’s multi-touch interface. The iPhone’s presence on the CES floor itself turned out to be not as ubiquitous as one might expect given the media attention it’s received since its June launch. While there’s no doubt that Apple’s latest device is hot, at CES at least, it’s still clearly living in the shadow of its big brother, the iPod—little surprise, given that the rosiest estimates of iPhone sales to date top out at about 5 million, compared to the more than 100 million iPods sold in the past six years. So instead of a bevy of new and innovative products for the iPhone, much of what I saw on the show floor this week represented a logical extension of the types of things already available for the iPod, adapted to take advantage of the quirks and unique features of Apple’s newest device. 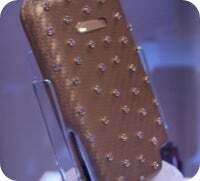 This diamond-studded iPhone case from Case-Mate could have been yours, if you had gone to CES this week. In years past, Macworld Expo has been overrun by vendors selling iPod cases and CES is little different. iPhone cases were a common sight on the show floor, ranging from the usual offerings of vendors like Griffin, DLO, and Belkin, to any number of smaller booths arrayed with an assortment of silicone skins, holsters, and hard cases. Aesthetics and practicality are always at war when it comes to case design and I saw examples from both ends of the spectrum. In one hall, Case-mate gave away a gold-colored case studded with real diamonds, and reputedly worth several thousand dollars; it wasn’t for sale to the public, though, so don’t bother saving your pennies. Meanwhile, OtterBox and H2O Audio were showing off iPhone cases designed mainly for robustness. OtterBox’s $50 Defender and $70 Armor cases for the iPhone are meant to keep the handset safe both from the elements as well as everyday damage; they brag that the Armor case is waterproof, dust-proof, drop-proof, and dirt-proof. H20 Audio’s $40 iFR case for the iPhone is impact- and element-resistant and includes an armband for the more athletic amongst us. The iPhone’s phone capabilities present some challenges for those wishing to build speaker systems. If you’ve ever left your iPhone anywhere near a set of speakers, you’ve no doubt heard the distinctive pattern of ear-wrenching static and beeping that indicate your phone is using its GSM radio. Some models of iPod speakers will offer to switch your iPhone into airplane mode when you connect it, but that’s hardly a perfect solution since it means you won’t be able to receive phone calls. The solution to the problem is simple enough: shielding the components in the audio device eliminates the interference, but it often incurs extra cost in manufacturing. Apparently, some vendors have decided that it’s a worthwhile investment. Altec Lansing was showing off their new iPhone-compatible $200 T612 speaker system, essentially a modified version of its existing M602 iPod speakers that not only adds shielding, but will even pause the music when a call is received and resume it afterwards. I also got a look at Vestalife’s new Ladybug portable iPod speaker system, featuring an innovative fold-out design that mimics its namesake. The $110 basic and $125 limited-edition models both support the iPhone as well. There were plenty of other iPod-compatible speaker systems at CES, as my colleague Dan Frakes has ably documented, but few were boasting iPhone compatibility as a selling point. When it comes to driving and using your phone, the iPhone is among the very worst offenders, as the nature of its buttonless interface can require you to devote more attention to it than to the road. Several vendors are devising ways to make this task simpler and safer for the good of all drivers. DreamGear’s i.Sound $100 RoadTalk incorporates a microphone, FM transmitter, and Bluetooth connectivity so your phone conversations are piped through your car’s stereo. The device plugs directly into your cigarette lighter to draw power and there are controls on it for answering calls. High-end luxury cars often provide similar features, but the RoadTalk makes that functionality available to pretty much any vehicle. Should you simply be looking for a way to get tunes from your iPhone onto your car stereo, Belkin will roll out iPhone-compatible versions of their TuneStage FM and TuneCast Auto at $100 and $80 respectively. Both will let you charge your iPhone while transmitting the audio to your car stereo; the TuneStage FM also holds the iPhone up with a flexible neck design, making it easier and safer to access without having to fumble around. If there’s one gripe I continue to hear about the iPhone, it’s about the recessed headphone jack, which prevents people from using many third-party headphones. Fortunately, headphone manufacturers have heard this loud and clear and CES saw several vendors releasing earphones that address this peculiarity. Popular headphone maker Etymotic was also showing off its own iPhone-compatible earphones. The $179 hf2 headset is based on Etymotic’s renowned ER-4P earphones, but also features an inline microphone and controls for the phone and music functions of your iPhone. The company also rolled out a Bluetooth headset, the $179 etyBLU Dual Mode Bluetooth Headset, boasting a detachable noise-canceling boom, noise-isolating earpiece, seven hours of talk time, and 100 hours of standby battery life. While most of what we saw at CES falls into the hardware category, there were a couple of companies showing off web applications that work with or are designed for the iPhone. 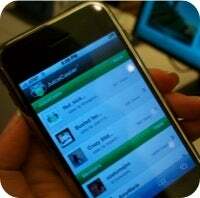 JuiceCaster lets you share and view videos online via your iPhone. JuiceCaster is a social network site designed to let you share and view videos online. It automatically detects that you’re using an iPhone and displays videos in a compatible MPEG4 format. While iPhone users can’t record their own videos to upload, due to a lack of video recording functionality, you can also access the site via your Mac and embed the player on other social networking sites like MySpace and Xanga. If it’s sharing music you’re into, FlyTunes is a forthcoming service that takes advantage of the thousands of available Internet radio stations to provide you with an unparalleled selection of music, streamed directly to your iPhone. Software installed on your PC or Mac works as a middleman, building a channel tailored to your musical preferences. And by caching 30 minutes of audio on your iPhone when a Wi-Fi signal is detected, FlyTunes doesn’t chew up your iPhone’s precious battery time. Of course, many of these products should also appear at next week’s Macworld Expo in San Francisco, along with what’s likely to be a host of other iPhone accessories that didn’t make it to CES. While the iPhone presence at in Las Vegas may not have been as strong as its big brother the iPod, it’s still clear that the iPhone is a major force in consumer electronics in general. And that’s a presence that’s likely to get even more intense as the iPhone moves into its first full year of availability.